Explore the world of low light photography with your camera. Do you struggle shooting at High ISO to get good results? If so, then this workshop is for you. This workshop will examine the techniques and processing required for achieving great results with low light photography, from using High ISO to bracketed exposures. The workshop will also include a presentation on how to process your images using Lightroom and Google NIK tools. There will be a practical element where participants can work both with High ISO (handheld) and with bracketed (and long) exposures (tripod mounted). 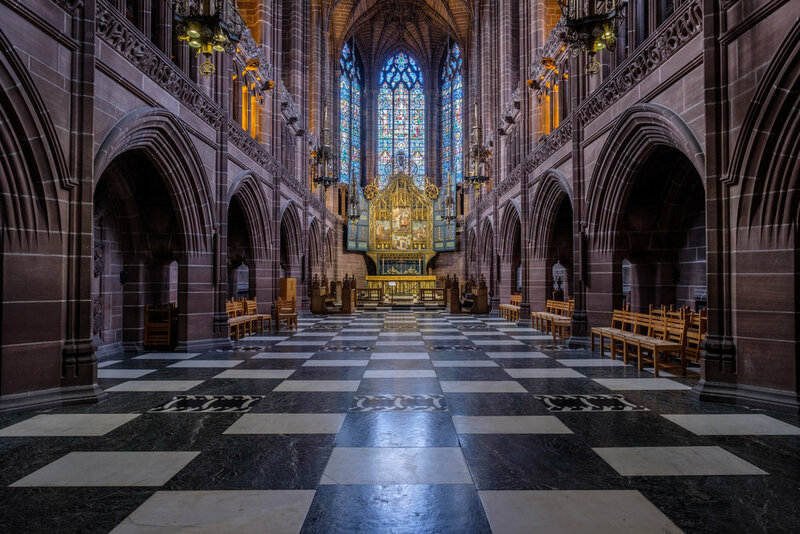 During the workshop we will visit the interior of both Liverpool Cathedrals (it is approximately 0.5 mile between Cathedrals). As the day progresses David will be on hand to provide guidance on both camera settings and advice on composition. Besides reviewing of the images on the day, David is happy to further discuss images after the event via email. We will break for lunch around 1.30pm. Participants are welcome with any recent (last 5 years) DSLR or CSC (Mirrorless Camera) with standard zoom lens. If you have them, then a wide angle lens and a wide aperture prime lens will also be useful. A tripod will be required for bracketed and long exposures.